Jay-Z’s new album 4:44 has been available for public consumption for less than a week, but according to the RIAA, it’s already achieved numbers that would suggest otherwise. As of Wednesday, 4:44 is certified platinum, signifying it has sold (technically streamed) at least 1 million copies. How it achieved such a feat might be more complicated than the certification implies. For one, 4:44 is not currently for sale, though a physical edition is said to be coming. Since Sunday, Tidal has offered a voucher for a free download for the album via Sprint. To go platinum this quickly, 4:44 would need to have been streamed the equivalent of 1 million times. (As of 2014, 1,500 song streams equals ten tracks, which equals one album.) Roc Nation is reportedly calling 4:44’s platinum status the result of pure streams, which, if true, would be especially impressive considering 4:44’s initial exclusivity. In its original release on June 30, only Sprint customers and existing Tidal subscribers could access the album. But on July 3, after some reported technical difficulties and fan frustration, Sprint and Tidal made 4:44 available for all Tidal users. With its announcement of the certification, the RIAA shared a photo of Jay-Z with RIAA CEO Cary Sherman and the platinum plaque, though it’s unclear when that photo was taken. 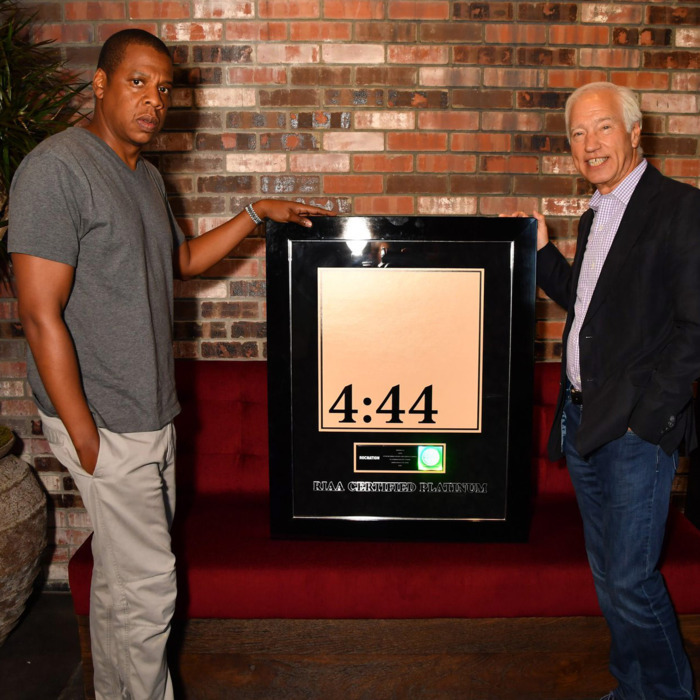 If the photo happened prior to 4:44’s release, it’s possible Jay-Z has repeated the paid upfront model he started in 2013 with the release of Magna Carta Holy Grail. Back then, Samsung prepaid for 1 million copies of that album as part of its deal with Jay-Z for exclusivity, allowing Magna Carta to instantly go platinum. The RIAA even bent its rules to accommodate this new form of digital sales finagling; Rihanna then followed Jay’s lead with her instant-platinum release of Anti last year in a similar deal of her own with Samsung. The RIAA hasn’t explicitly confirmed that 4:44’s platinum status was the result of prepaid albums, but in a statement to Vulture, it hinted that Sprint was involved: “Under the program’s rules, the artist needs to be compensated and there needs to be demonstrated consumer demand in the United States, either for an on-demand stream or a sale. A sale counts toward a certification if purchased directly by the customer or a business can purchase the album or song and offer it to fans who must take affirmative steps to acquire the album or song.” The RIAA also notes that while some might see this business model as a certification loophole, it wasn’t totally corporate. “Fans participated, took action, and downloaded Jay-Z’s album offered by Sprint,” the RIAA said. Sprint and Tidal have so far not announced the existence of any such deal in which the cell phone provider bought 1 million “copies” of 4:44 prior to its release — they also haven’t released the early streaming numbers yet — but such a deal could explain how the album went platinum so fast. (Vulture has reached out to Sprint and Tidal for further clarification.) For comparison, Kanye West’s The Life of Pablo took over a year to go platinum, and was the first streaming-only album to achieve those numbers; Beyoncé’s Lemonade, which is also a Tidal streaming exclusive but was made available for download days after its release, took almost two months to go platinum. But regardless of how Jay-Z did it, with 4:44 he now has more platinum albums than any other hip-hop artist in history. Update 3:45 p.m.: Sources told Variety that the photo of Jay-Z and RIAA’s CEO was taken before 4:44’s release, throwing more weight behind the theory that prepaid downloads were involved. Roc Nation also tells Billboard that the certification is based on one million downloads alone, not any streams. Billboard says it will not count any Sprint-bought downloads toward 4:44’s charting position in accordance with its rules, meaning Jay-Z will only have first-week streams to rely on for a chance at a No. 1 debut. How Did Jay-Z’s 4:44 Go Platinum So Fast?